"Eagles" © Troy White 2000	Oil on canvas, 46" x 34" SOLD. George Carpenter was from Oil City Pennsylvania. 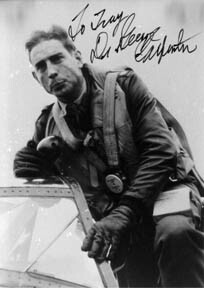 He enlisted in the US Army in March 1941but was rejected from flight training because of a reaction to an inoculation. He left the US Army and by Christmas 1941 he had earned his wings in the RCAF. He shipped out to England and was assigned to No. 121 Eagle Squadron. He remained with the unit after it was absorbed into the USAAF as a member of 335 Squadron. 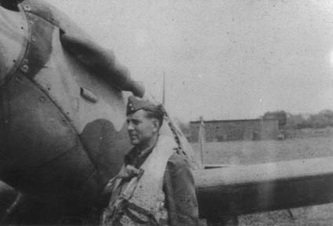 He was Squadron Operations Officer from December 1943 until becoming CO of 335 Sq on 5 February 1944. On 18 April 1944, he was shot down by enemy fighters over Germany. He bailed out and was made a POW. He is credited with 13.883 aerial victories, all but one scored with the P-51B between 16 March and 12 April 1944. He was awarded the Distinguished Flying Cross with five Oak Leaf Clusters and the Air Medal with three Oak Leaf Clusters. Signed & numbered Artist's Proof, edition size: 10. Prints remaining as of 2 November 2018: 7. Overall print size: 22" x 36". Each print is co-signed by three RAF Eagle Squadron pilots.